My conversation with Sierra Leone shows once again that there is much work to be done, and that international community must urgently step-up its response. Canada can and must do more to help the people of West Africa, and must turn its announcements into commitments on the ground. As the United Nations said, a humane world cannot allow Africa to suffer on such an extraordinary scale. Twenty-five hundred people have been infected with Ebola, 900 have died, and 580 have recovered in Sierra Leone; the disease remains "very stubborn, despite all the measures taken", including quarantining five of the country's 14 districts. This past Sunday I spoke via telephone with Professor Monty Jones, Special Adviser to the President of Sierra Leone and Ambassador-at-Large, who is responsible for overseeing the Ebola response in the country, and who outlined the needs of his country to me. Sierra Leone requires community-based care centres, a thousand more beds, and considerably more healthcare workers. Three to four healthcare workers are needed for each patient suffering with Ebola which means that the country needs a minimum of 500 more doctors, 2000 nurses, and 1000 technicians with a range of specialties. Burial ceremonies in which mourners have direct contact with the body of the deceased person remain a particular challenge in Sierra Leone, as the Government works to stop the spread of the disease, while trying to give a decent burial to each of its citizens. Previously, burial customs included "crying, mourning, touching the body," but now there are no ceremonies, no touching, and "burials are fast-tracked." The Special Advisor to the President explained that a swab is taken from each of the dead in order to ensure someone has not died of Ebola. Unfortunately, there are not enough ambulances, not enough laboratories, and not enough technicians to analyze the blood samples. As a result, there is a backlog of these samples, which means there is an accumulation of bodies to pick-up. Sometimes bodies remain in houses for three days; the longer a body remains the greater the chance that someone will want to touch their loved one. 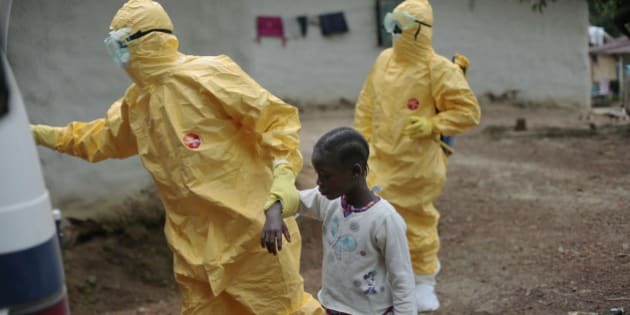 According to the WHO, burial ceremonies in which mourners have direct contact with the body of the deceased person can play a role in the transmission of Ebola. Labs currently process 50-100 samples per day, but they need more labs and more technicians so that 500 samples can be analyzed per day. The Special Advisor to the President is particularly concerned about possible travel bans, and what such bans might mean to the economy, and the importation of food, and desperately needed healthcare and medications. Sierra Leone was "one of the fastest growing economies in the world", and the World Bank ranked it the 6th fastest reformer. "Economic growth was at 11 percent, was predicted to go to 14 percent, but has now dropped back to 7 percent." A ban would cripple the economy further, and prevent much needed food and medical help from coming in. The Special Advisor provided reassurances that people are thoroughly screened in Sierra Leone airports with thermometers and infrared temperature screening, and if there is even a slight increase in temperature, they are turned back, and turned back to healthcare. It is hoped that the international community will continue to respect the known science with regard to travel bans, and not make political decisions that would hurt Sierra Leone further. It was made clear that the economy and healthcare will need help after the Ebola outbreak, and that we should not forget the people of Sierra Leone and indeed, West Africa. Several humanitarian organizations have relayed the same point to me: healthcare systems have effectively collapsed and will require substantial support to be rebuilt and strengthened. My conversation with Sierra Leone shows once again that there is much work to be done, and that international community must urgently step-up its response. Canada can and must do more to help the people of West Africa, and must turn its announcements into commitments on the ground.